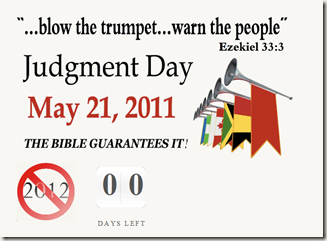 Update 5/23/11 - 6:45 p.m.
Today 6:14 PM Camping says again that Judgment Day Came, "It Was Just Spiritual." "The timing, the structures, the proofs, none of that has changed at all," says Camping. He is sticking to the numerology he used to determine the May 21 and Oct. 21 dates. "All I am is a humble teacher. I search the Bible. I search the Bible," he says. California preacher Howard Camping says his prophecy that the world would end was off by five months because Judgment Day actually will come on Oct. 21. Do you think God has a three-strikes policy? Harold Camping is "flabbergasted" that the world didn't end, according to a story in the San Francisco Chronicle. "I'm looking for answers," Camping said to reporters outside his home. Well, though one of my predictions was that Camping would disappear -- I'm glad he didn't. He needs to answer for his false prophecy. Just look for a revised third date for the Rapture soon. OK, it's 12:02 a.m. The world didn't end, even though Harold Camping said "The Bible guarantees it!" I'm not sure what's worse: Harold Camping's fear-mongering blasting out over billboards, the Internet, and airwaves -- or the media reporting on it. Why would they give this guy more free advertising when he was wrong once before? Oh, right -- these are the same guys who gave Donald Trump a platform to talk about President Obama not being born in the United States. Mr. Camping has been a full-time volunteer since Family Radio's infancy and has never received compensation for his service. I wonder how he puts bread on the table? Oh, I forgot! He's a civil engineer. What Qualifies Mr. Camping to make the pronouncement of May 21, 2011? Mr. Camping has been a tireless student of the Bible for over five decades. The tens of thousands of hours he has spent analyzing the Bible has given him a unique perspective of the entirety of Scripture. He has dedicated his life to prepare himself to answer questions raised concerning God's Word to man. I hope Camping realizes now that those "tens of thousands of hours" were a complete waste. Think about what you can do in 10,000 hours. I think the greater damage (as far as the media is concerned) is how reporting on this story helps spread or amplify anxiety. Take a look at Orson Wells's "War of the Worlds" 1938 radio broadcast to see how the media can amplify anxiety (even when it's in the name of entertainment). Take a look at the Bush administration's use of Terror Alerts to see another example. What if May 21 ends and nothing occurs? The Biblical evidence is too overwhelming and specific to be wrong. Christ's people can look with great confidence to this date because God promises His "beloved" He will not come upon them as a thief in the night. God in His mercy has revealed the vital information needed to know the day. 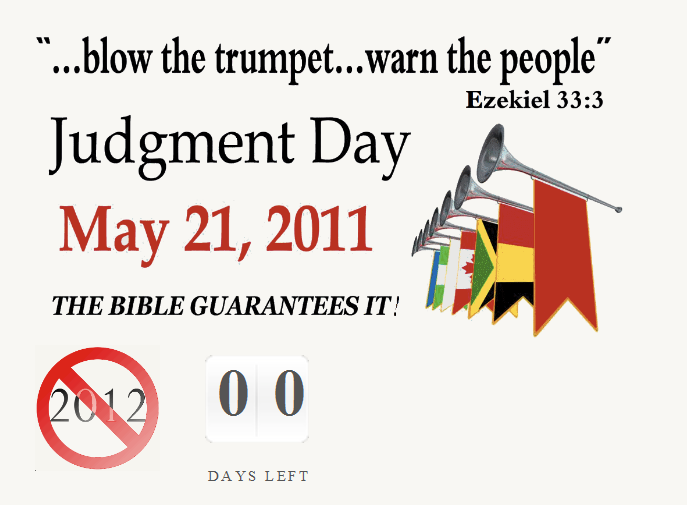 Judgment Day on May 21, 2011 will occur because the bible declares it. Anyone whom God has not saved will arrive at that day with no hope for salvation. God warns simply the "door will be shut." I'd love to see some good investigative journalism about Camping to find out what's really going on at Family Radio. Does your cat need its own toilet?